The Financial Times, a popular international business newspaper , has released its list of the world's top 100 B schools for the year 2012. Stanford Graduate School of Business has been ranked as the number one B school for the first time. Harvard has been pushed to second in the list. 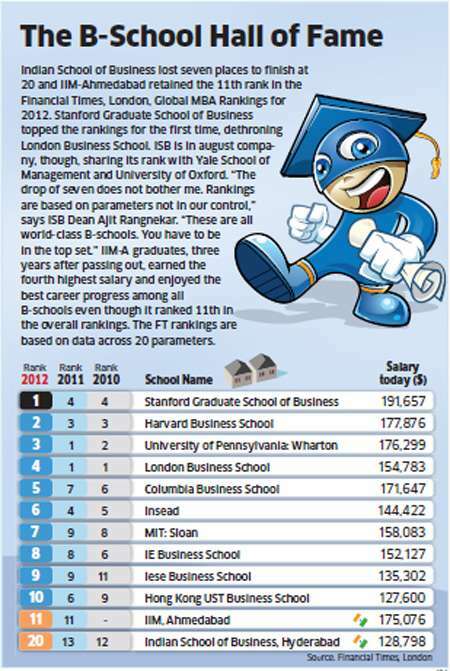 IIM Ahmedabad and Indian School of Business is listed in No.11 and No.20 position worldwide. Copyright AdLogger, Detect Click Fraud.